They say the hospital is understaffed and is releasing patients prematurely to save on costs. 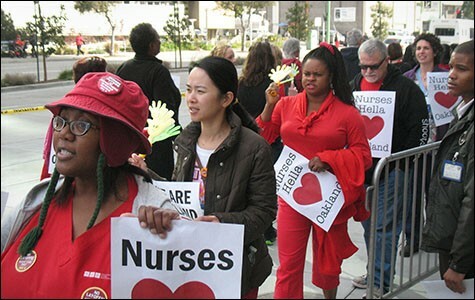 Nurses protested cutbacks at Kaiser Oakland last week. Wait times for women in labor have become increasingly long at Kaiser Permanente Oakland Medical Center. That's according to Jenna Dran, a registered nurse in the labor and delivery unit, who said that it's not uncommon for mothers preparing to give birth to spend hours in the waiting room and in triage before they are admitted to their own rooms. "It's embarrassing and we are helpless," said Dran, who cited one recent case of a cesarean section that was scheduled for the morning, but delayed until late afternoon. The father, as a result, almost missed the birth because he had to pick up their other child, she said. "He was in tears. It was awful." Dran said the reason for the all-too frequent backlog is clear: There aren't enough nurses. She estimated that in her department, about twenty nurses have left over the last three years for a variety of reasons — and that Kaiser has only filled two of those vacancies. "It has gotten extremely unsafe," said Umma Amina, another labor and delivery nurse. "I feel very, very stressed out. And I feel angry." These kinds of grievances extend beyond labor and delivery. Nurses throughout the hospital have accused Kaiser of implementing a series of cost-cutting measures that have resulted in substandard care for patients and a severely overworked nursing staff. 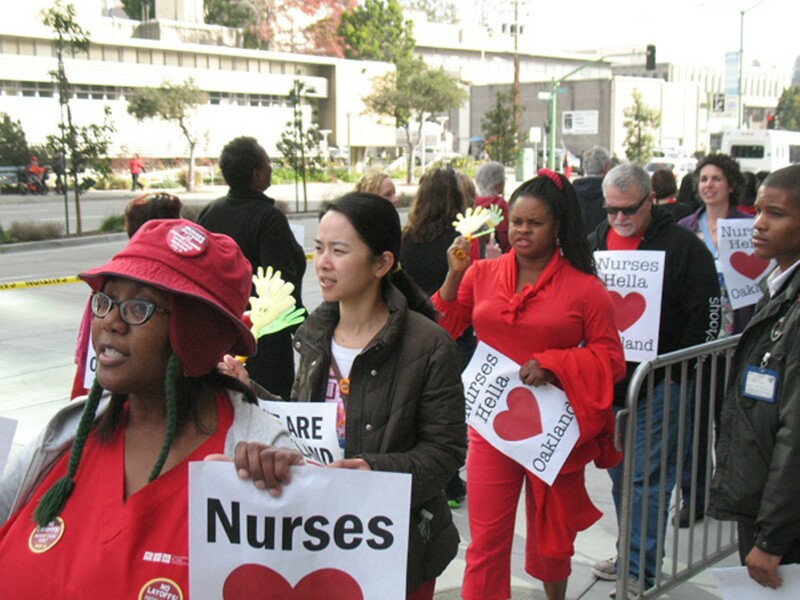 Critics spoke out at a rally last week organized by the California Nurses Association (CNA), the union that represents 17,800 registered nurses at Kaiser facilities throughout the state. And the outcry has swelled in recent months in response to threats from Kaiser management to cut 75 nurse positions in Oakland, according to union leaders. Officials with Kaiser — the largest nonprofit health provider in the nation with 9.1 million members at 38 hospitals — say the union is distorting facts, and that the hospital's management is not trying to cut positions. But nurses in multiple departments said that they are responsible for more patients per shift than ever before and that patients are regularly being sent home sooner than they should be. As evidence of the growing challenges at Kaiser Oakland, nurses said that there has been a massive increase in Assignment Despite Objection (ADO) reports, which are formal complaints nurses file when they believe there is a situation of "unsafe staffing." In 2013, there were 1,402 ADOs at the medical center, which is more than double the number of reports in 2012, according to CNA spokesperson Debra Grabelle. "It's patients that are not being admitted when they need it, patients who are discharged too soon, and patients being in the wrong level of care," said Katy Roemer, who has worked at Kaiser as a maternity nurse for ten years, regarding inadequacies that result in formal complaints from nurses. For example, she said, patients that should be sent to the intensive care unit are regularly being discharged to the medical surgical unit, where they aren't properly monitored. And other patients who should be admitted into the hospital are simply being discharged, she said. "It's absolutely worse than any time that I've been here," Roemer said. "I'm worried about coming into work sometimes." Gabriela Wijegunawardena, a nurse in the neonatal intensive care unit, said that about six years ago, nurses would be devoted to one or two patients on a single shift. Now, they routinely have to care for three patients at a time. "I've had to put off their needs and attend to other things. ... The quality of their care is definitely being sacrificed," she said. "And it's really scary that it's the patients that are the ones who are suffering." She also said that in some cases, premature babies are being discharged a full month earlier than they would have been in the past, based on new, less-strict criteria. The criteria for admission into neonatal intensive care unit have also become less strict, she argued. In the emergency room, there are several consequences of understaffing, nurses said. For starters, patients are now often left waiting longer to be admitted from the ER into the hospital — not because there aren't open beds, but because there aren't enough available nurses to care for them, said Britta Houser, an ER nurse. Those patients then take up space in the emergency room, creating further waiting room delays for those who haven't yet been seen at all, she explained. "They could be having a heart attack. They could be having a stroke. They could be having a seizure. And we don't have anywhere to put them," said Houser, noting that on busy evening shifts last year, the ER would have 21 nurses working. Now, sometimes there are as few as fourteen. "You can kind of see the domino effect," she added. The lack of adequate staffing in the emergency room has become so dire that rooms aren't being properly cleaned, said Dran, who is an elected member of the facility's "professional performance committee." These concerns, she noted, arose in a recent committee meeting, at which nurses can air grievances and make recommendations. In the emergency department and in operating rooms, nurses are struggling to perform basic cleaning services, she said. One impact of all of these shortcomings, nurses said, is that they often have a sense of guilt when interacting with patients, and in some cases, suffer from post-traumatic stress disorder. "Nurses feel like they are getting beaten down every time they come for a shift," said Wijegunawardena. Nurses further argued that the organization does not need to cut corners. Kaiser Permanente, across its eight regions, grew by approximately 95,000 members from January through September 2013, according to its most recent quarterly report, which indicated net income of $2.2 billion for the first nine months of last year. That was up from $2.1 billion during that same period in 2012. For its part, Kaiser Permanente officials said that the nurse staffing level in Oakland meets and exceeds state-mandated requirements. Decisions about patient care are made by physicians and are based solely on what is best for the patient, said Claude Watts, interim senior vice president and area manager for Kaiser Permanente East Bay. He said that in the case of labor and delivery, if the hospital needed additional staff due to the number of mothers in labor, managers would quickly arrange for that. And if there are fewer nurses in a specific unit, it's because there are fewer patients present, he said. "We pride ourselves on taking care of our patients and being fair to our employees," said Watts. In Northern California overall, there are three hundred fewer patients per day in Kaiser Permanente hospitals than ten years ago, he said. Kaiser is also providing care in other "delivery settings," such as medical offices, at home, by phone, and online, he said. Addressing accusations that the hospital is pushing patients out to reduce costs, he cited progress in medicine. "When you look at health care as a whole, because of the different pharmaceutical advances, because of the different technological advances, the length of stay in hospitals has decreased over time. That's the course of getting better at what you do," said Watts, who is also chief operating officer at Kaiser. "It's part of the changing landscape of health care. ... People are staying in less, because we are getting them well sooner." As a result of these kinds of changes, Kaiser's nursing needs shift, he said, citing, as an example, improvements in the medical surgical unit creating shorter patient stays. On this floor, "we're getting to the point where we have more nurses than we need," he said. Kaiser Permanente has attempted to engage the union for more than a year to address the fact that some units are overstaffed while other units require overtime and temporary nurses to cover shifts, Watts said. Officials have not tried to make cuts, but last year proposed a reorganization that the union rejected, he added. "We have actively been trying to sit down with CNA in order to move this forward," he said. Watts also denied reports of inadequate cleaning, noting that operating rooms are cleaned between every case and that the cleaning duties of nurses have remained consistent. Regarding ADO unsafe staffing reports, Watts said that there were only about 500 forms submitted in 2013, not 1,400 as the union suggested. A CNA rep, however, sent me detailed documentation of the 1,402 reports filed last year.